Welcome Axe Thor, Blonde Black Widow and Cull Obsidian to the Marvel Legends line-up. A movie so big it’s split into two parts is going to have at least two waves of Marvel Legends action figures. Here’s a look at the 15 figures from comics and movies making up series one and two of Hasbro’s Avengers: Infinity War line, including a trio of exclusive reveals (hint: look up). Hasbro’s been slowly revealing the figure lineup for these two waves over the past year, showcasing characters at San Diego Comic-Con, Hascon, New York Comic-Con and last month’s Toy Fair in New York City. But with the Marvel: Universe Unites charity event in full-swing leading to the March 3 launch of tons of movie-related merch, the time for slow reveals has passed. First, here’s a look at all eight figures in Avengers: Infinity War wave one. Though the line is due out on March 3, the toys are already circulating on auction sites. That’s fine, we’ve still got the first look at the official images for Bearded Captain America, Iron Man, Iron Spider, Proxima Midnight and her build-a-figure boss, Thanos the Freshmaker. By Captain America’s beard! Check out the new shield. Looks very Wakanda. I feel like we’ve seen this Iron Man before. Not Spider-Man, but rather Iron Spider, courtesy of Tony Stark. Proxima Midnight, one of Thanos’ most powerful servants, made her comic book debut in 2013's Infinity crossover. One of the wave’s comic book figures, Serpent Society. Really didn’t need another Taskmaster comics figure, but here we are. Thanos is the Build-A-Figure of the line, bits of him scattered about every packacge. Songbird was revealed at last year’s inaugural Hascon event. Sadly she’s just for the comic books. I guess it’s for the best—that hair is too good for real life. Then we have the second wave, coming later in the year, featuring characters from the comic books, the upcoming Ant-Man sequel and three characters from Avengers: Infinity War, which we’re revealing for the first time right here. Well, we revealed them up at the top of the post. 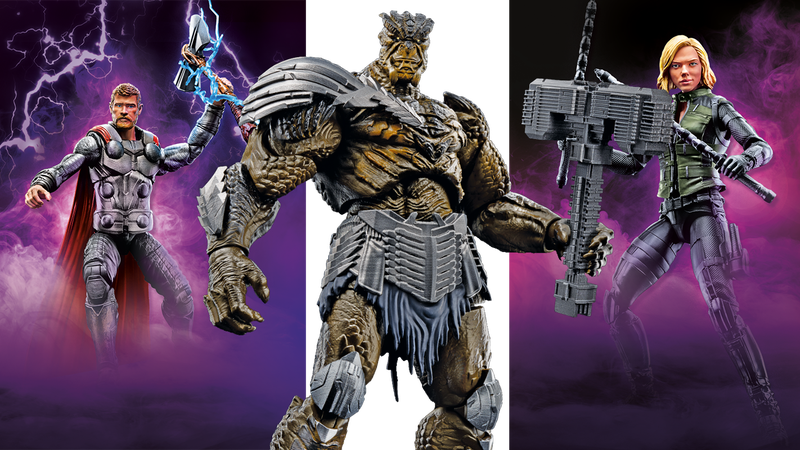 You can see Thor, Black Widow and Cull Obsidian again in the slideshow below, along with some insect friends and a gloriously insane-looking dark elf. Also revealed at Toy Fair, this is the comic book version of Malekith, ruler of the dark elves. Scarjo is looking mighty badass as the blonde Black Widow. This is Cull Obsidian, another of Thanos’ cinematic servants. Maybe Thor can borrow that hammer. Another comic book figure, the Black Knight will not be appearing in the movies. Sad. Behold Thor, wielding what looks to be an axe and possessing both of his eyeballs. And finally we have Wasp, Ant-Man’s so much better half. Look for these figures and more to be all over my desk in the coming months.